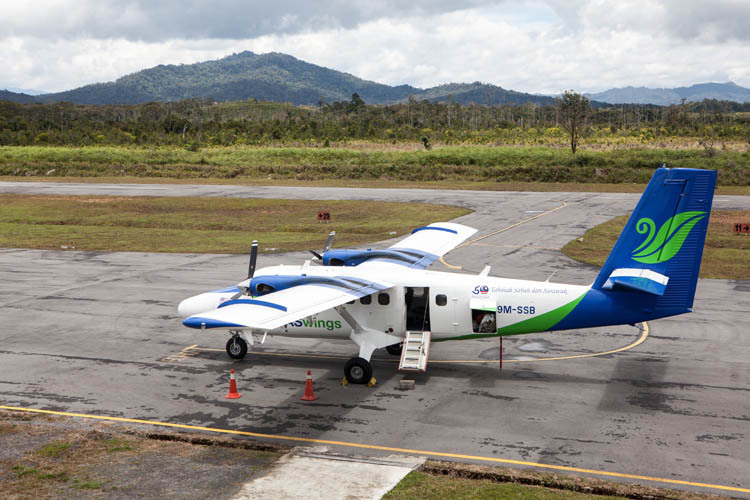 A 45 minute flight in Twin Otter plane south from Miri (on the Sarawak coast, just to the west of Brunei) to Bario passes over some awesome terrain – and some that is pretty awful. Miri is an oil town, but the offshore rigs that dot the sea around Miri soon give way to a different kind of oil production, with an almost endless series of oil palm plantations stretching off to the horizon. 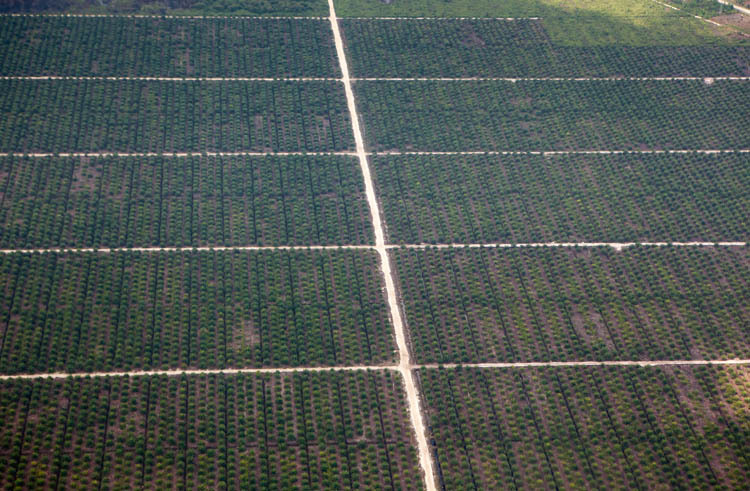 Millions of hectares of the bio-diverse Bornean forest have been converted to oil palm monoculture. This has lots of short and long-term consequences – almost all of them bad. 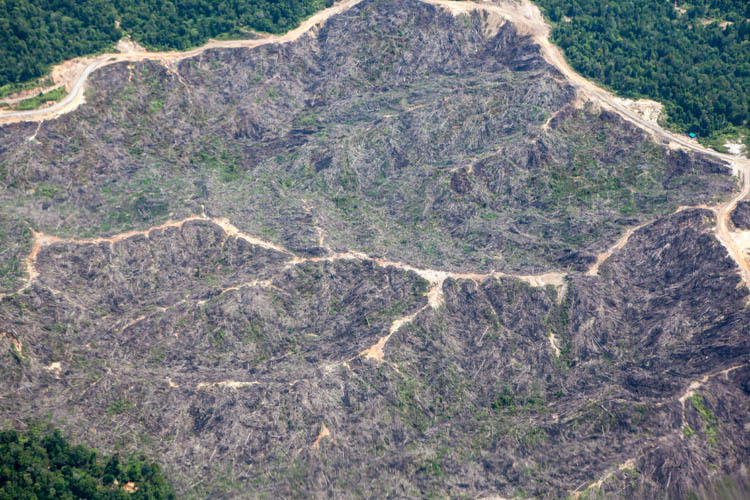 Deforestation, appropriation of traditional lands, soil poisoning, disrupted economies, and declining biodiversity. 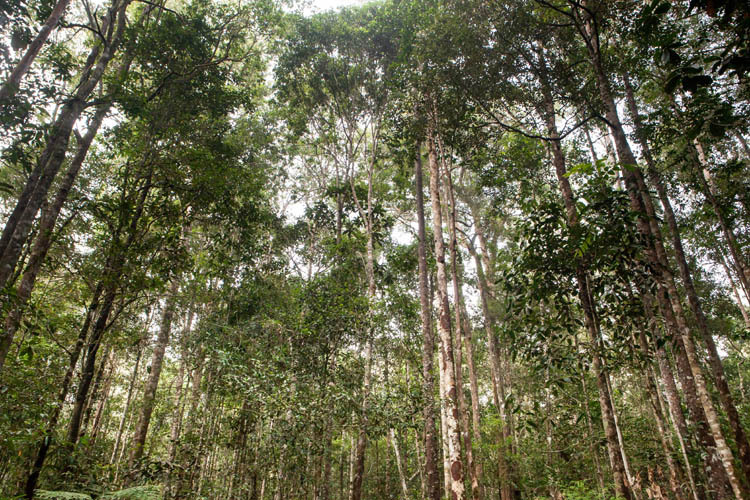 For example, I’ve just read in the excellent Birds of Borneo book that primary (pristine) forest supports over 220 species of birds (along with 1200 tree species). In the oil palm plantations a maximum of 12-14 species of birds can be found. Further inland it’s forestry that prevails. Mostly it’s ‘selective’ logging as above. But there are other areas that for some reason are just clear-felled (there are thousands of fallen trees in that middle area above). Mostly they get terraced and converted to oil palm plantation. 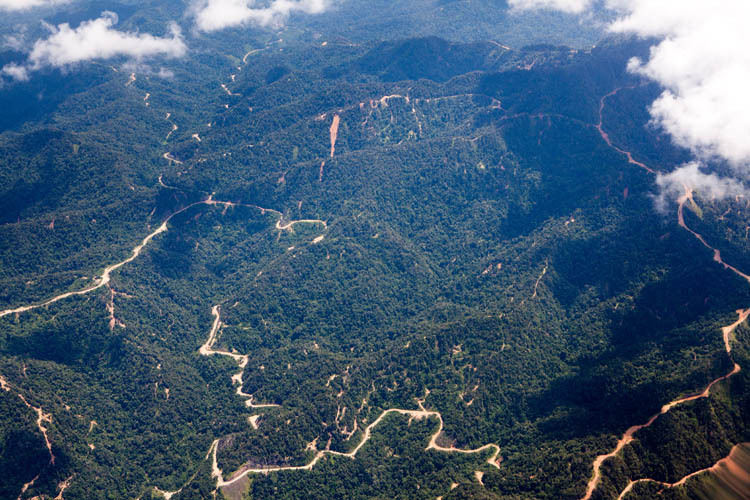 Gradually you see (with some relief) the country below become more rugged, wild, and heavily forested, and soon the plane touches down in Bario, the main village in the Kelabit Highlands. 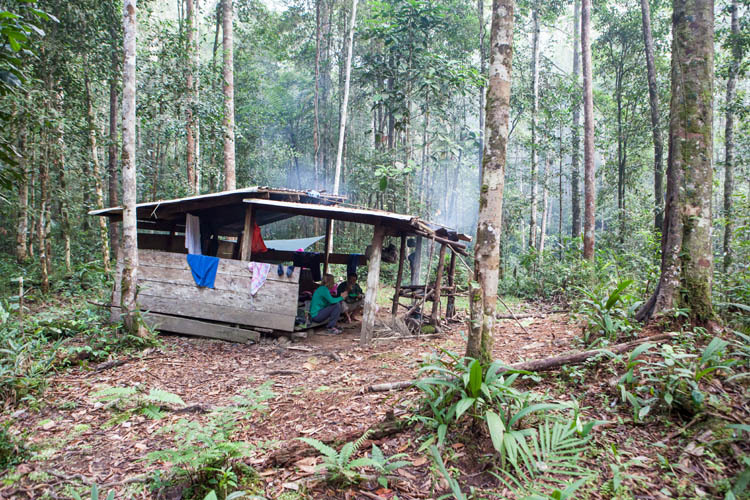 This remote area along the border with Indonesia (East Kalimantan) is really interesting, both for the landscape and the remarkable Kelabit people who inhabit it. 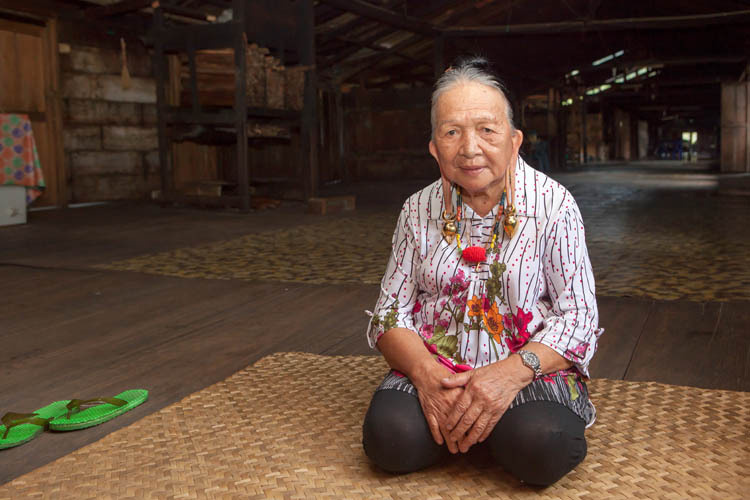 There’s only 6500 Kelabit people, but their dynamic nature and their strategic location has meant that they have received a lot of attention of the years. During the 2nd World War, Australian and British troops parachuted in and recruited, armed and trained the Kelabit to mount a guerrilla campaign against the occupying Japanese forces. (With considerable success – a plaque erected by the grateful Australians at the end of the war proudly notes that they “soon controlled 25,000 square miles, and bagged 1900 Japs”.) 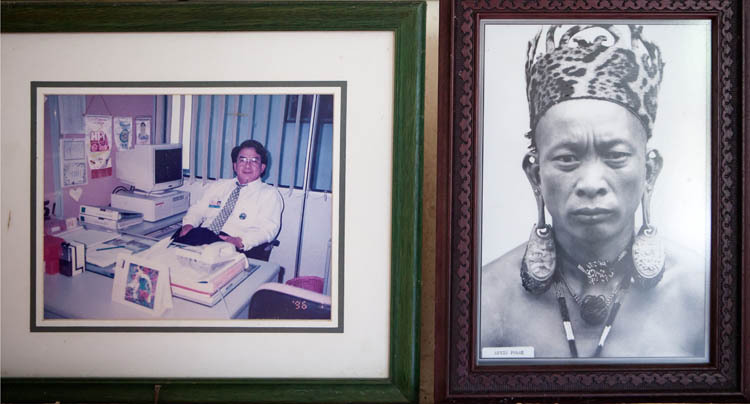 Tom Harrisson, who led the troops, was for many years after the war the curator of the Sarawak Museum. The boat in the picture above was being prepared for us to board for a 90 minute journey downstream. The guy at the back of the boat steers and controls the motor. The guy at the front gives advice about imminent collisions with submerged logs and rocks (we had maybe 100 such collisions en route) and the guy in the middle just sat still holding a rifle. We believe he was looking out for wild pigs – not recalcitrant Imperial Japanese soldiers. And as usual there was a sudden downpour in the middle of the journey. It was fun. 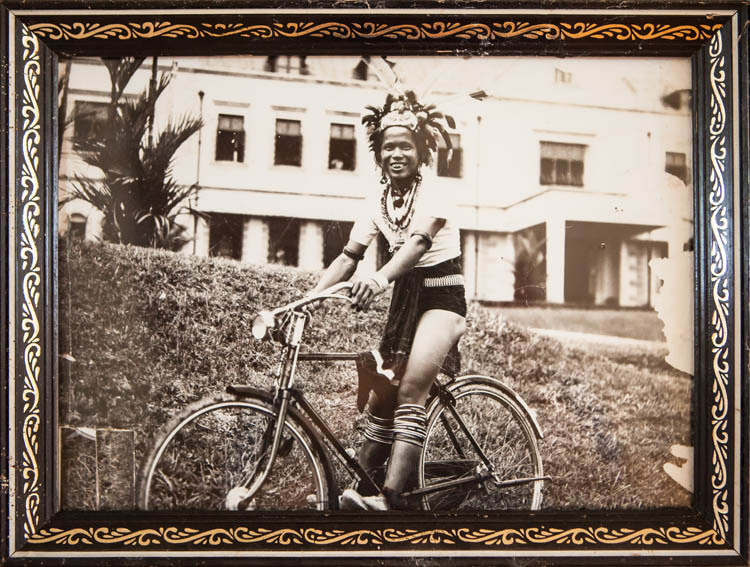 From the 1940’s, missionaries were very active in the area, and the entire population has abandoned traditional Kaharingan animism in favour of Protestant Christianity. 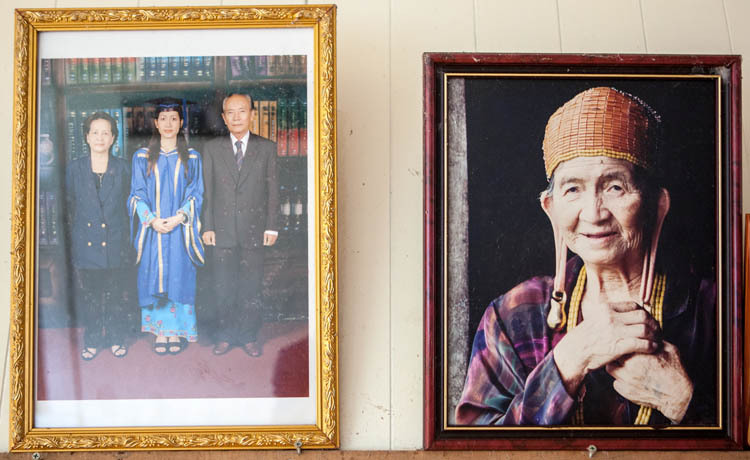 At the same time they embraced education with gusto, and the Kelabit people are now found in senior positions in academia, government and business across Malaysia. The area was at the front line of the Konfrontasi between Indonesia and Malaysia in the 1960’s, and several villages were evacuated and later re-settled. An extraordinary dose of cultural change in just one or two generations. 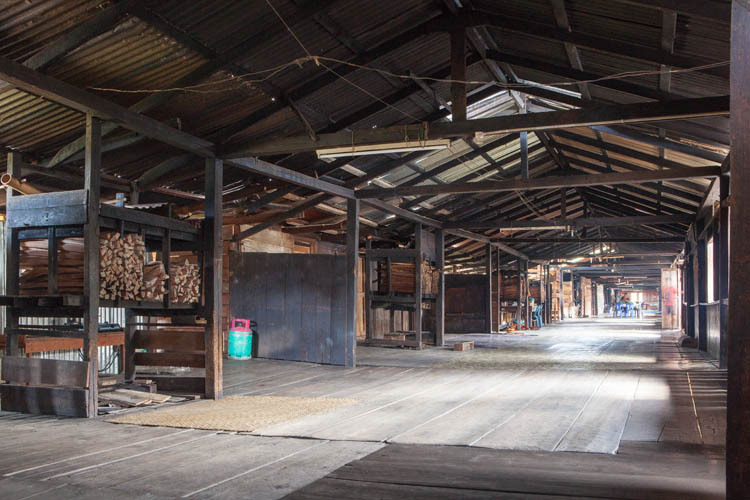 The longhouse of the Kelabit Highlands have a long common hall area which is where family photos are proudly displayed. 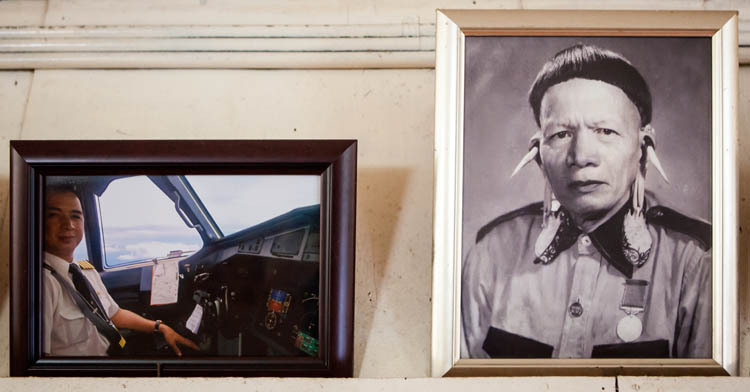 There are some wonderful juxtapositions of photos; parents and grandparents in traditional attire (hairstyles, extended earlobes, heavy tattoos etc) alongside their children at university graduations, in offices and aeroplanes. 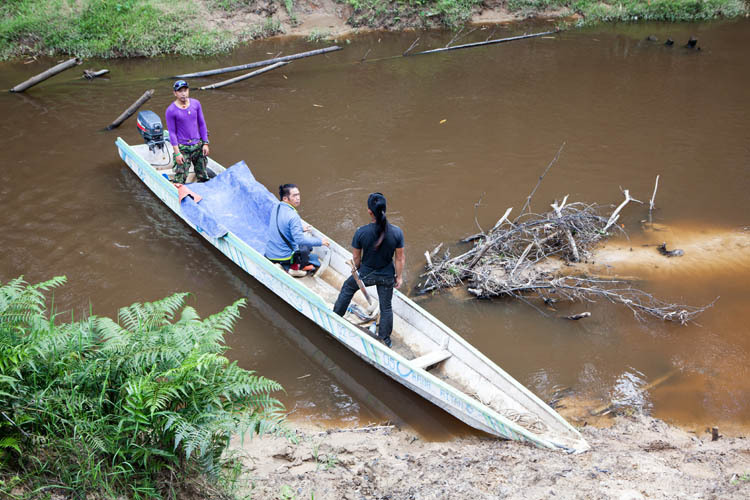 About half the Kelabit population has left the area to live in the cities for study or work. Of those who remain, most now live in separate free-standing houses, but some (a declining number) still choose to live in longhouses. Their longhouses have each family’s kitchen area out in the open communal part of the building, each with its neat little stack of firewood keeping dry above the fireplace. 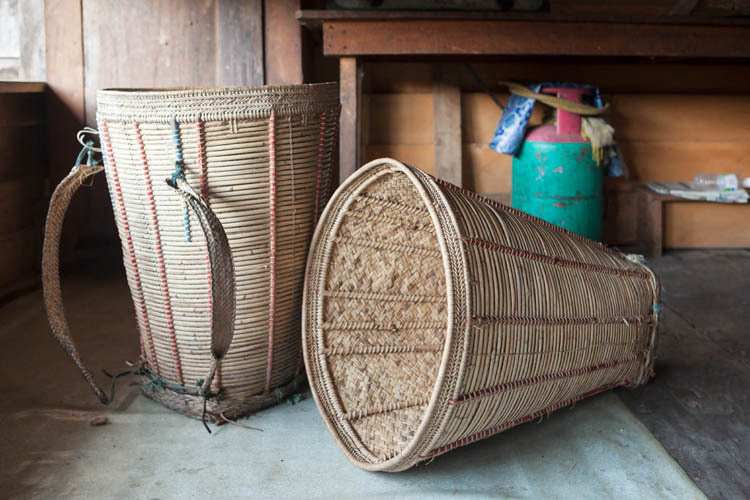 Rattan and bamboo are still used to make a range of baskets, carriers and mats. Some – like these ones above – are quite beautifully made. From Pa’Dallih village a guide took us along tracks up and across the River to a site in the forest which was an ancient burial site (Benatuh Pa’Diit). Urns carved from stone were used to store the bodies (or maybe just the bones) of the deceased. 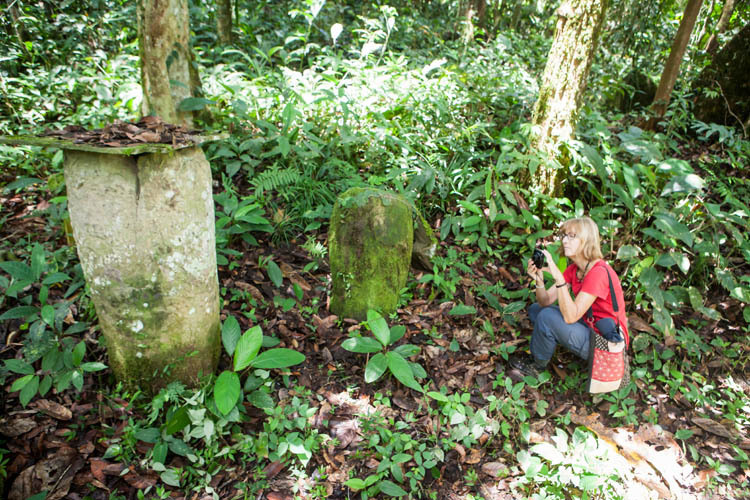 This site pre-dates the arrival of Chinese pottery jars in the area, which became pretty much ubiquitous across Borneo, and which were used for the same purpose in later years. We stayed in three villages (Bario, Pa’Lungan and Pa’Dallih), but he highlight was probably a jungle trek into some wild country along the Indonesian border. There are several trails, and continuing strong cultural ties, between the villages on either side of the porous border. Our guide Petrus (from Pa’Lungan village) was fabulous. He showed us how to get fresh drinking water from inside vines and bamboo, how to cook babi hutan inside bamboo with fruit, herbs and leaf vegetables collected from the forest. 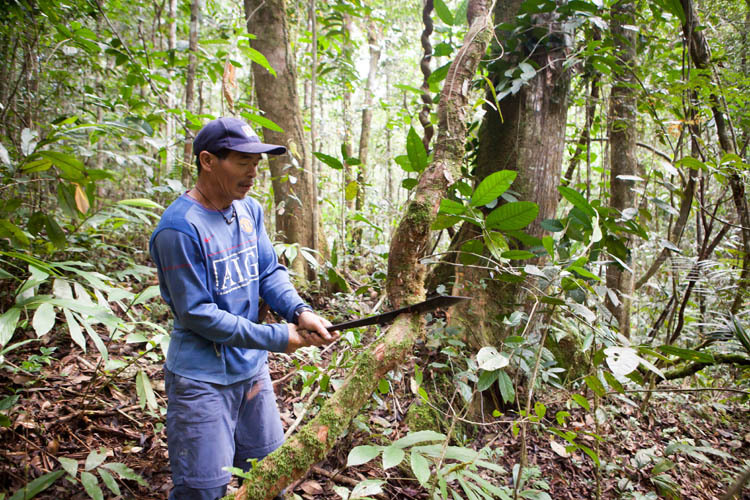 He showed us where the sun bears had torn off bark to get at the bees and honeycomb underneath. He showed us which tree produces a highly flammable sap for use in candles or as fire-starters (better than Little Lucifers! ), and how to make your own darts for your blowpipe. He was patient when we repeatedly misplaced the walking poles that he cut for us, and he was greatly amused by how obviously we hated the abundant leeches (between us we got around 100, mostly on our legs and feet). We spent the night under a shelter in a little clearing by a creek in the jungle. It was the only ‘building’ we saw in the forest. We bathed in the creek, and could hear the sound of its waters, the insects, birds and monkeys through the night, and a hornbill landed in a nearby tree in the morning. 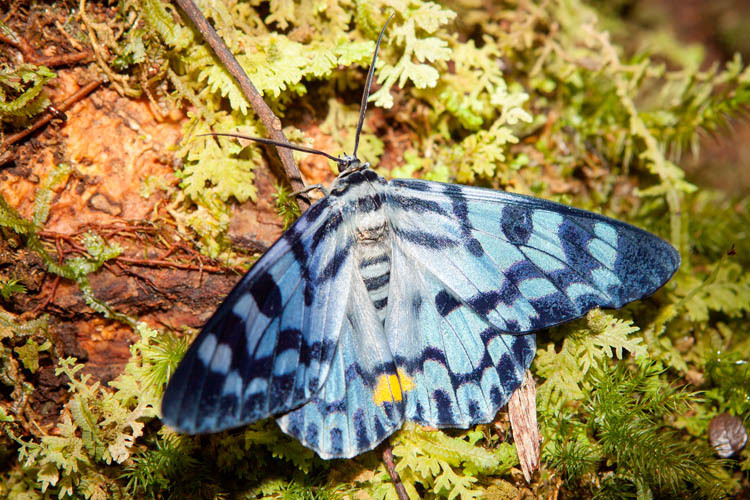 We still haven’y got used to the extraordinary number, variety, size and splendour of the Kalimantan butterflies. They swarm in some locations, each one as gaudy as the next. There are about 100 (highly valuable) buffalo at Pa’Lungan village. There’s currently no road to the village, and the buffalo are used to transport all manner of stuff into and out of the village, on wooden sleds that they drag behind them. 200kg is their load limit. Many of them are currently being deployed to cart loads of river stone for construction of the new solar power plant for the village. The contrast of technologies is wonderful! A new road is under construction, but it currently stops two kilometres from the village as the project ran out of money. 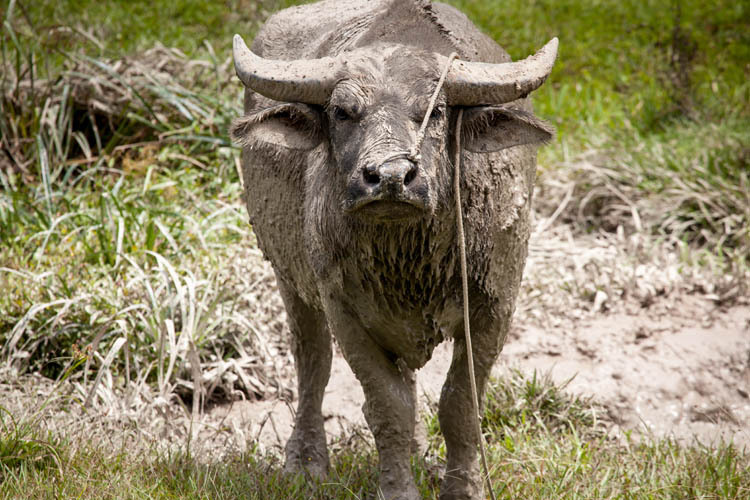 When complete it will fundamentally change life in Pa’Lungan – not least for the buffaloes! As we were about to fly out of Bario after our week in the Kelabit Highlands we noticed a hornbill sitting on the railing at the top of the air traffic control tower. 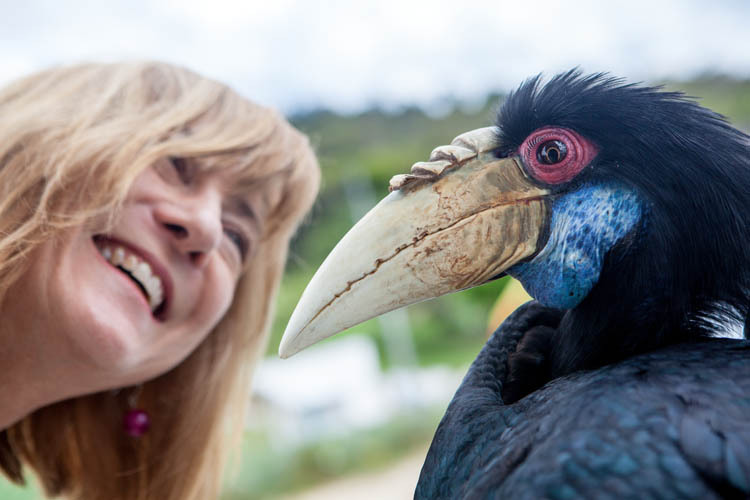 The flight controller invited us up the ladder and introduced us to ‘Turuh’, a female Wreathed Hornbill who comes in from the forest and hangs around the airport on most days. After weeks of trying and failing to get close to any hornbills to photograph, it was a nice end to our visit to meet the very friendly and compliant Turuh. This entry was posted in General and tagged Bario, Kelabit, Miri, Oil Palms, Pa'Dalih, Pa'Lungan, Sarawak. Bookmark the permalink. Hi, I’m fy, A master student from Unimas in Kuching. Now I am doing a study in Bario, Kampung Annah Rais and Kampung Mongkos in Kuching. I found that you ever been to Bario Highlands before. Therefore, I would like to invite you to fill a survey regards service quality in Bario Highlands and yours satisfaction and destination revisit intention to serve my thesis’s purpose. I would be very appreciating that if you can give a hand to help. You can fill the questionnaire using the link as shown as below. Thanks.